Jeffrey's Bay, less than an hour drive from Port Elizabeth, its a surfer’s haven on the Sunshine Coast in the Eastern Cape. Jeffreys Bay was once a port for coasters and received its name from the nineteenth century trader J.A. Jeffrey. 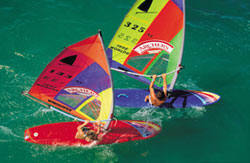 But Jeffreys Bay is more than just a surf town, it is welcoming and friendly to everyone looking to have a great time. Jeffreys Bay’s wave season runs from June to August, but good waves can be had as early as April or as late as September. So don’t forget to bring your board, but remember that this is South Africa’s winter so pack a good wetsuit as well. South Africa’s premier wave is at Supertubes, which for 10 days each July hosts the Billabong Pro, a World Championship Tour event. At this time of the year the waves are an awesome Hawaiian size one-to-three meters high, placing them among the top ten swells anywhere. Other surf spots in J’Bay include Tubes further down near The Point, Albatross, Boneyards, Magnatubes, Kitchen Window and Main Beach. Best of all, you don’t need to bring anything as there are a full range of surfing services from a surfing school to equipment hire and specialist shops. If all you want is relaxation then head for Dolphin Beach, a stretch of sand and surf awarded international Blue Flag status – an eco-grading given to beaches or marinas that meet the highest safety and environmental standards. Here there are always fully equipped lifeguards on duty, making it a place where the family can spend a glorious day in the sun. Dolphin Beach is also favored by body boarders and windsurfers, and every summer there’s a touch rugby festival on its sands. Close by is Get Wet, which houses a long, snaking supertube, the perfect place for parents to relax as their children hurl themselves onto the slide to spiral down to the pool below. For those opting for a drier outing there’s mini golf, which is open all day, but most popular at night when there’s a lively atmosphere. Other J’Bay activities include tandem skydiving, sand boarding, jet-skiing, whale and dolphin watching, ocean diving, kiting and quad biking. Or go to the Park Lane Entertainment Centre which offers bumper cars. For those who want to know more about the environment there is The Shell Museum, which houses the largest collection of seashells in South Africa. The Penguin Centre is also a popular attraction, as is the Lombardini Game Farm just outside the town. Here you will find rhino, giraffe and a number of buck species. African Wildlife sanctuary 25 km from town offers the perfect getaway for families to enjoy a variety of wildlife. Or drop in to visit the locals. With a tour of the Tokyo Sexwale township you will see how life unfolds in a small formal settlement. Make sure to look out for the barber shop where only two people can stand inside. Among the eateries is the quaint The Sunflower restaurant, popular with both residents and surfers. Here by candlelight and the strum of a guitar you can watch the nightlife stream past. Also busy is Guido’s, a pasta and pizza restaurant, and the bars along the beachfront. There are a host of accommodation options from backpacker lodges to luxury guest houses. The budget Surfpackers, situated near the beach, is popular among surfers. There is also well-priced accommodation at Ashton Bay, Kabeljouws and Jeffreys Bay Caravan Park. Jeffreys Bay (Afrikaans: Jeffreysbaai) (34°02′S 24°55′E) is a town located in the Eastern Cape Province of South Africa. The town is situated just off the N2 Highway, about an hour's drive southwest of Port Elizabeth. Jeffreys Bay is one of the five most famous surfing destinations in the world and hosts the annual Billabong Pro WCT surfing event at Supertubes during July. Spectators and surfers from all over the world flock to this event, which can be viewed live over the internet and various television channels. Boneyards, SuperTubes, Impossibles, Tubes, Point, and Kitchen Windows are all famous surf spots located in Jeffreys. Jeffreys has people from all over the world, as it is also the home of one of the largest YWAM (Youth With A Mission) bases in South Africa. At any given time, there are representatives from at least 20 different countries. Jeffreys is a popular tourist destination because of the surfing and the blue flag beach. Jeffreys has grown from a sleepy little fishing town over the past few years and is one of the fastest expanding town / city in the country. It is also the home of the annual Billabong Pro surfing competition. This International event attracts professional surfers from all over the world, and many tourists as well. It is broadcasted over the internet and digital satellite series providing publicity for the sponsors and competitors. Jeffrey's Bay is a constituent part of the Kouga Local Municipality in the Eastern Cape Province. Jeffreys Bay is a picturesque town situated on the coast of the Eastern Cape. Bracketed by an amphitheatre of towering mountains and its world renowned surfing beaches. Talented surfers skilled to ride their boards in the tubes of majestic waves or just ahead of the great white rollers will tell you that the professional rate Jeffreys Bay amongst the ten best surfing points in the world. And conchologists say the beaches here are unbeatable for the variety and number of seashells. Over 400 types of seashells make this the most abundant natural coastline in South Africa. Jeffreys Bay was once a port for coasters and received its name from the nineteenth century trader J.A. Jeffrey. A resort also popular with anglers has adequate visitor accommodation. Info Jeffreys Bay does not add commission fees to Bookings, All Rates Quoted Subject to Change.